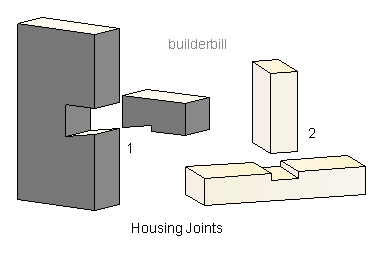 Joints that have one member, usually with a plain end set into or housed into another member. Used in joinery and carpentry. On this page also:- Through Housing, Stopped Housing, Dovetail Housing. An extremely simple but very effective joint. Shown above are a couple of housings as we would use them in cupboard or shelving construction. A plain straight Through Housing that is normally made with a wood router. 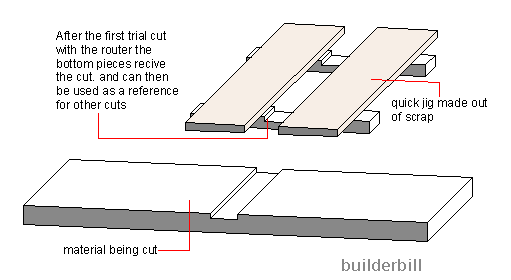 The router is never used freehand for this type of work but it is very simple to make a home made jig for it. See the sketch below. The face appearance of the through housing can be improved by stopping the housing trench short of the face of the panel. This requires a small shoulder to be cut into the shelf member, This Stopped Housing)gives a lot neater finish to the end product. A Dovetail Housing, used in cupboard carcass construction and also in some framing joints, but generally it is superseded now by the use of metal plate connectors. 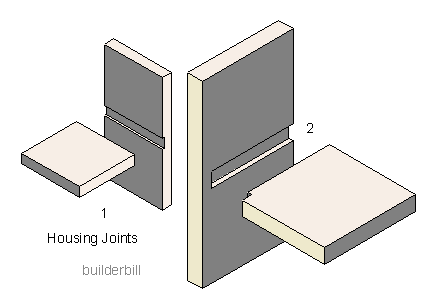 A wall framing joint between stud and plate.